This course is designed for taxi drivers and private hire drivers who transport passengers who may have a disability, limited mobility or an impairment. 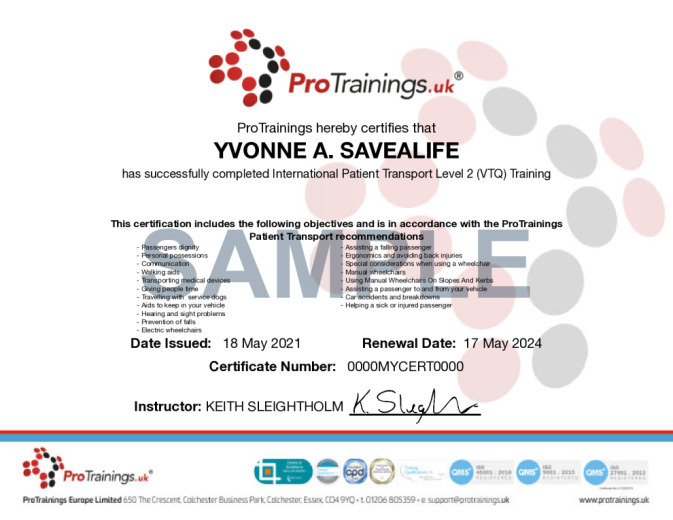 This course is designed to teach any taxi or private hire driver the important differences to transporting passengers who have a disability or impairment. You will learn how best to help someone to ensure that their journey with you is enjoyable and as possible. You will also learn how to help keep yourself safe and free of Injury while helping someone or assisting them to get about. At ProTrainings we believe training should not end when the class finishes, we also believe that you should have as much choice as possible in the way your training is delivered, to make it more convenient and flexible to fit in around busy work schedules and other commitments. This course comes with 2.0 hrs (3.0 class) of CPD, although the time to complete the course online may be less than this. Total course time includes 1 hour and 20 minutes of video training as well as knowledge reviews, final test, remedial help and reviewing downloaded material.